Originally written for the James Bond Classic Charity Golf Tournament for UNICEF, held on Monday June 11th, 2001 at Stoke Poges Golf & Country Club. When Ian Fleming was asked about the source of the name for his suave British Secret Agent with a Licence to Kill he admitted that he had taken the name of the author of a book that he had read and that was currently on his shelf at Goldeneye, Jamaica. That book was, “Birds of the West Indies” (short title) or “Birds of the West Indies: An Account with full description of all the birds known to occur or to have occurred in the West Indian Islands” (full title) by James Bond, B.A. (Cambridge) – Research Associate in Vertebrate Zoology of the Academy of Natural Sciences of Philadelphia. The full title was later changed, in 1947, to “Field Guide of Birds of the West Indies: A Guide to all the species of birds known from the Greater Antilles, Lesser Antilles and Bahama Island”. The sub-title has changed several times over the years. Dr. Bond’s book was first published in 1936 and was printed by Waverley Press Inc of Baltimore, Maryland. The book was actually published by the Academy of Natural Sciences of Philadelphia and would have had a limited print run. The book measured 5 1/4″ x 7 1/2″ x 1 1/8″ and contained 456 pages. There were black and white line drawings throughout and a colour plate at the front of the book of the, “Cuban Tody”, This and the book’s illustrations were by the artist, Earl L. Poole. There was a dust cover issued with the book and the title was embossed in gold on the spine and at the top of the front boards. Copies of this book with dustcover is very rare today. By 1947 the interest in an up-to-date Filed Guide for “Birds of the West Indies” was such that Dr. Bond rewrote his 1936 work in a more popular style and included material from his recent research. The Macmillan Company of New York City re-published his book. Again the, “Cuban Tody” was on the front dust cover, in full colour as it had appeared on his 1936 edition. The front cover and spine was a forest green with black lettering. I believe that it was this 1947 edition that Fleming had on his bookshelf at Goldeneye. Dr. Bond’s book was published in the UK for the first time in 1960 by William Collins & Sons and Company Ltd. A year later in 1961, Houghton Mifflin Company, Boston published the book in the USA. Although the copyright page indicates that this is a 1st American Edition, it is really a 3rd American Edition if you consider the 1936 and the 1947 printings. The dust jacket artwork was done by artist Samuel Bryant. All of the British and American editions were printed in Great Britain until 1985 since which date they have been printed in Hong Kong. The 1960 and 1961 editions had approximately 80 colour illustrations. The artist who did these new illustrations was Don R. Eckelberry. Both publishers continued to use just over 180 of the original line drawings done by Earl L. Poole in these new editions. In 1974 (UK) and 1980 (US) a second colour illustrator was added to the title page credits. Arthur B. Singer was given credit for 7 of 16 colour plates included in these printings. 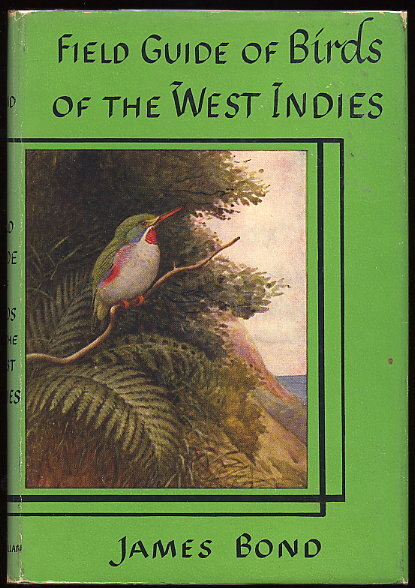 For the next 40 years both the American and British publishers continued to keep, “Birds of the West Indies” in print. In 1993, the American publisher issued that year’s edition as part of the Peterson Field Guide Series. The book was given book number 18 in the series. This edition contained over 340 illustrations and described over 400 species of bird. It was last printed in September 1999 and is still available in the U.S.A. In England, Collins printed their last edition of the book under Harper Collins in 1993. 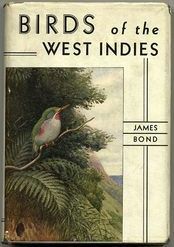 “Birds of the West Indies”, is currently out of print in the U.K.
On February 5th 1964, Dr. James Bond and his wife visited Ian Fleming at Goldeneye. Sadly it was their only meeting, as Fleming died of a heart attack six months later. James Bond was born on January 4th, 1900 and received his B.A. degree from Cambridge University in 1922. Several years after graduating from university he joined the staff of the Philadelphia Academy of Natural Sciences. He began his survey of the West Indies in 1926 and visited over 80 of the islands of the Bahamas and Caribbean, where he encountered almost all the bird species native to the Antillean region. He also authored, Check-list of Birds of the West Indies”, and numerous papers on birds of tropical America. He received the Musgrave Medal in 1952 from the Institute of Jamaica and the Brewster Medal from the American Ornithologists’ Union in 1954, for his works on the West Indian birds. The real James Bond died peacefully in his sleep in February of 1989 at the age of 89/ The various editions of “Field Guide to Birds of the West Indies” continue to be much sought after by Fleming and Bond Collectors. U.S. re-print of Houghton Mifflin Fifth Edition (1993 Impression) unknown year but after 2001. ISBN: 0-618-00210-3 (Paperback) – Printed in China. U.K. re-print of William Collins Sons & Co., Ltd. unknown year but copyright by The Easton Press in 1990 (Norwalk, Connecticut) Printed in Hong Kong. Special red leather with gold embossed boards, no dust jacket. U.K. re-print of William Collins Sons & Co., Ltd. unknown year but re-printed the 1985 Fifth U.K. Edition, probable 2001. Picture Boards, no dust jacket issued. Book appeared in the 2002 James Bond movie, Die Another Day. Printed in China. – Still available on Amazon UK. French language – 1996 – ISBN: 2-603-01018-2 (hardcover) picture boards, no dust jacket issued. published by Delachaux et Niestle. Text copyright 1990. Various editions are available on Amazon US, UK and Canada as well as ABEBooks.com. Oh my God! James Bond and I share the same birthday!